Since I got my first telescope, I quickly discovered its abilities and limits, and I knew I wanted more. In fact, I wanted to be able to show other people what I saw, even if they couldn’t be there themselves. That meant learning how to do astrophotography. I learned from reading online—and by using it myself—that my first telescope wasn’t suitable for astrophotography for a number of reasons. It was too light (being a large, empty tube for the most part), shifted too easily, not mechanized in any fashion, the Dobsonian mount was too simple, and I lacked any adapters to allow me to connect my camera to it. Taking a photo through it meant getting an adapter which would overweight the end, and so I’d have to constantly hold the whole thing still and counterbalance the weight, manually find and track to objects, and somehow manually follow the motion of things in the sky—with an altazimuth mount not designed for tracking, which didn’t have measurements, markings, or indices. To be honest, I was having trouble even finding objects in the first place, needing sometimes several minutes to track in on naked-eye objects (which would then flit out of view in seconds). So I had to get a new telescope. I wanted something slightly more compact so I could carry it out to sites more easily, so I chose a Schmidt-Cassegrain telescope, which combines lenses and mirrors into a relatively compact body. 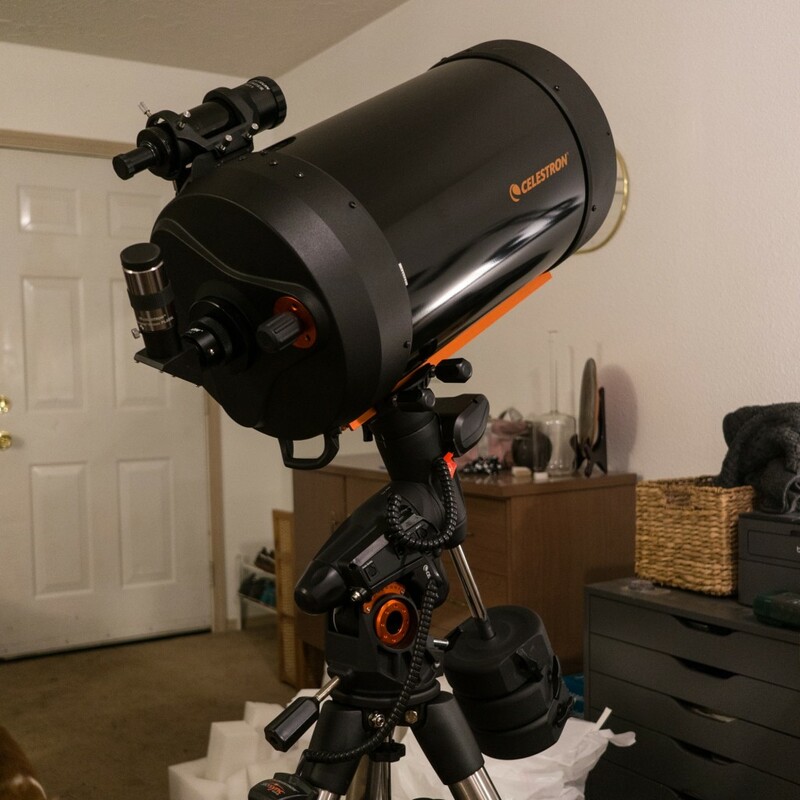 I wanted to increase my aperture even more, so I looked for eleven-inch options and settled on a set from Celestron which combines the telescope I want with a computerized mount that can automatically find and track objects. Putting all this together and learning how to use it has been a trial, but I’m getting better. It’s been cloudy here for weeks, so I’ve been messing around with it indoors learning how to align it and get it ready. A few nights ago, it finally cleared up enough to try it out. Outside my backdoor, between the house and a nearby fence, there’s a sliver of sky through which the ecliptic passes, meaning I can watch planets rise and pass overhead. Recently, Jupiter has been rising early at night, right around the time the moon rises. I took the pieces outside to the back walkway—tripod, mount, eyepieces, tube—and set up, switched on the mount, and did a quick alignment. Jupiter was low on the horizon to the east, climbing, visible as an unmistakably bright point. 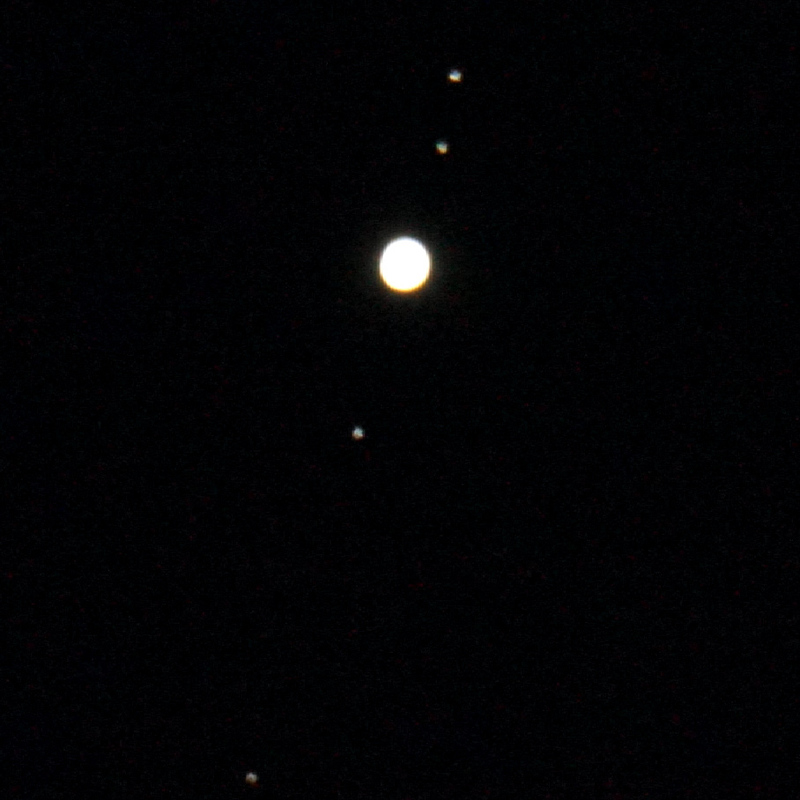 Once the tube was lined up close enough to see through the finderscope sitting on top of the main tube, Jupiter was obvious, a brilliant point surrounded by four smaller points. I started with my largest (and least magnifying) eyepiece, the forty-millimeter one (giving me seventy-times magnification). It’s the one visible in the photo of the telescope above. Jupiter was clearly in view but out of focus, so I saw it as a large, diffuse disc with a large hole in the middle, the way light looks through a telescope which happens to have a large obstruction. In this case, the obstruction is built into the telescope, the center corrector mirror in the middle of the tube. I began focusing, and Jupiter came into view, no longer a point but a disc which was obviously wider than tall, with four points of light scattered in a line along the bulge. The shapes shifted and scintillated slightly as the air moved around. This was my first time using computerized tracking, and I was so happy that the planet stayed in view rather than drifting just off out of view in a matter of moments. I found that I had to make adjustments after fifteen minutes or so, but these were pretty minor, likely because I didn’t do a proper alignment. When this happened, I could make them as fine adjustments with the handheld controller pretty easily, so it was so much less exhausting than my last experience. This automatic help made it easier to work on getting the best view I could. Focusing in on a tiny object like a planet is a little frustrating because it’s plain to see there’s more detail there, but when you try to focus on it, you find yourself hitting a point beyond which it only gets blurrier again. Some of this is attributable to the limits of my optics, but most of it is due to the turbulence of the atmosphere, called seeing. From the ground, unless the circumstances are exceptional, atmospheric seeing limits the detail available to telescopes, meaning that more magnification usually doesn’t help. Still, I tried. I brought out my twenty-five millimeter eyepiece, a shorter eyepiece with higher magnification (around 112 times). To my surprise, that gave me more detail this time. This proved to me that the tube itself was of higher quality than my previous telescope—or maybe just better seeing than last time. With careful focusing, I make out the cloud bands with my eye, and I thought I could even glimpse the Great Red Spot if I squinted. What I saw was a lot like the video I posted at the top of this entry (only brighter with more obvious moons). I’ve never tried photographing a planet before, so I decided it was time to try now. I had found an adapter kit for my camera (a Sony NEX-6), so I took out the eyepiece and used the prime focus attachment, which essentially uses the telescope tube itself as a massive zoom lens, but without attaching any additional eyepieces. This meant no magnification beyond the tube’s own field of view, meaning that all the light the mirror was gathering was pulled into a small disc which shone too brightly to see any detail. Below is a picture showing roughly what this looks like. After recording some pictures and video in this setup, I tried using an adapter that lets me use an eyepiece, getting me a lot closer to what I was seeing. I used the twenty-five millimeter eyepiece and the adapter to attach to the telescope, and after some careful focusing, I got several shots like the following one. To get this shot, I had to fool around with the camera a bit, speeding up its shutter speed to cut down on the light that was obscuring details. This one was exposed for only 250th of a second. The moons are no longer bright enough to show up except as pale specks seen on zooming in. I applied some minor processing to improve the clarity, but that’s all. Otherwise, this is just a single snapshot of exactly what I saw that night. What’s next? 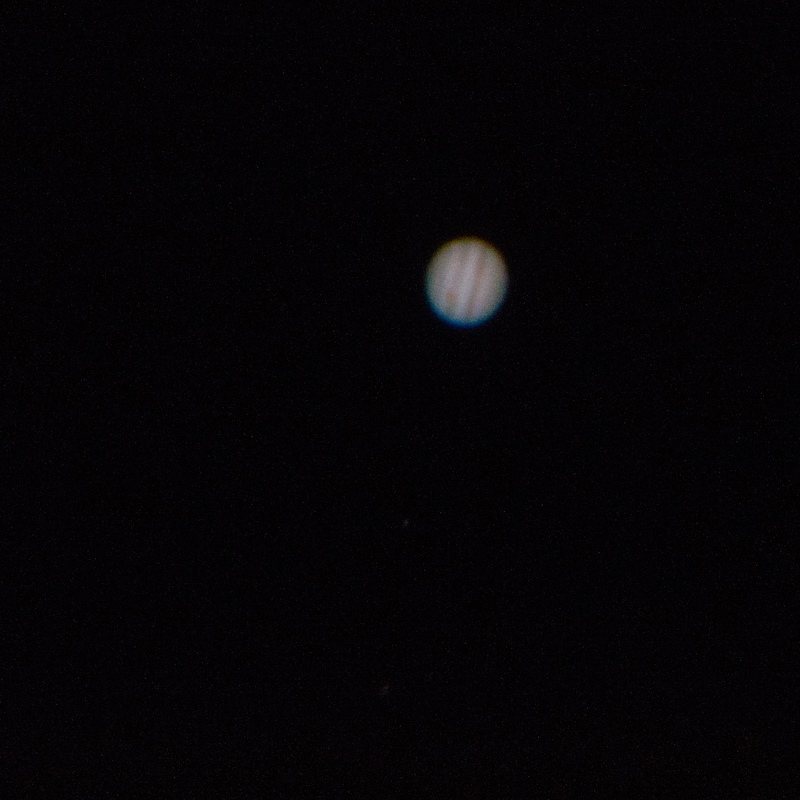 My current Jupiter shots impressed me more than I’d hoped for, but because of seeing, it’ll take some tricks to get more detail and more impressive photos. I’m looking into image stacking software which will let me combine many individual pictures into a single, more detailed shot. I’ll need it if I want to photograph deep-sky objects like nebulae or galaxies. And I’ll need to improve at aligning my telescope so it can track more accurately. It might take until summer, but I’ll update here when I try again.